The monument is an oblelik. It stands five feet high and probably a foot wide. On all sides of the monument are symbols and phrases regarding the Grand Lodge. On the base of the monument are the words on each of the four sides: FORTITUDE, PRUDENCE, JUSTICE, and TEMPERANCE. Freemasonry came to Macon in 1824 when the city was in its infancy. Macon Lodge No. 5, F. &A.M., was organized in 1824 and chartered by the Grand Lodge of Georgia in 1825. Historians have referred to Macon lodge as being the “First society in the town of Macon.” In 1846 the Grand Lodge of Georgia, F. &A.M., moved its seat from Milledgeville to Macon and for many years held its annual communications in the hall of Macon Lodge No. 5. Dr. Ambrose Baber, M.D., a physician and pioneer citizen of Macon, was the first Worshipful Master of Macon Lodge and later served the whole craft in Georgia as Grand Master of Masons during 1831. He died accidentally in 1846 and in the following year a monument was erected to his memory by joint action of the Grand Lodge of Georgia, Macon Lodge and Constantine Chapter No. 4, Royal Arch Masons. In 1825 during his triumphal tour of the United States by Brother and General the Marquis De La Fayette, the Freemasons of Macon and other groups lavishly entertained and honored this famous and beloved French nobleman who had contributed so much to the cause of American liberty by serving as a comrade-in-arms with Brother and General George Washington. 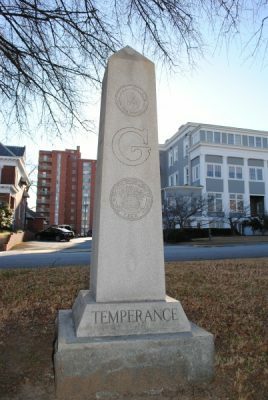 The Grand Lodge Obelisk is one of 9 lodge markers.